The DXT Ergonomic Precision Mouse is a compact ergonomic mouse which has been expertly designed by a team of leading UK physiotherapists and ergonomists. The DXT precision mouse promotes a neutral (more vertical) wrist posture while allowing the hand to work in the precision grip. It is the only compact ambidextrous ergonomic mouse that has been designed to use the precision movements of the hand. 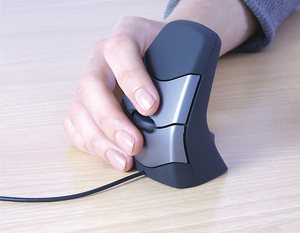 2.2" x 1.7" x 3.2"
Ergonomic Relaxed Neutral Wrist and Hand Position - The design of the DXT Ergonomic Mouse enables the hand to work from a relaxed position reducing the tension on the soft tissues. In addition the vertical design avoids extreme twisting of the forearm helping to increase comfort. Precision Grip for Accurate Navigation - Similar to a pen grip the DXT design allows for accurate navigation. Small muscles and joints of the fingers have higher processing abilities for movement and sensation than other larger body parts. The large muscle groups of the shoulder are adapted for power and larger ranges of movement whereas the smaller muscle groups of the hand are adapted for finer, precise movements. By pressing a single button the DXT instantly switches between right and left handed use. It does NOT require primary button function change in the Operating System, regardless of left or right handed use. The DXT Precision Mouse’s unique compact design fits a large range of hand sizes. Unlike other ergonomic mice the DXT Precision Mouse’s compact design is ideal for laptop and travel use. The resulting hand and finger posture facilitates precision movements and avoids the fingers being placed one upon the other and coming into contact with the cable (Figure 1). 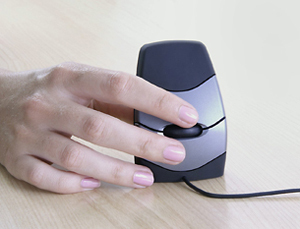 It should be noted that the body of the mouse is not placed parallel to the side of the keyboard but at an angle to the side of the keyboard as shown in Figure 2. Research Based Concept - why it works - Using a mouse to navigate the cursor and activate icons is a precision task that demands a high degree of accuracy. Scientific research shows that designing pointing devices is best accomplished by basing the concept on the design of the human body, since this results in the most efficient and accurate moving of the cursor. Small muscle and joints in the fingers have higher information processing abilities for movement and sensation than other body parts. The upper limb has evolved to be agile and strong. In order to deliver both agility as well as strength each joint and associated muscle groups of the upper limb have developed their own purpose and function. The larger muscle groups that operate the wrist, elbow, and shoulder are adapted for power and a larger range of movement. The smaller muscle groups that operate the fingers and thumb have more agility. When all the parts work in synergy, both movement range and agility can be maximized. 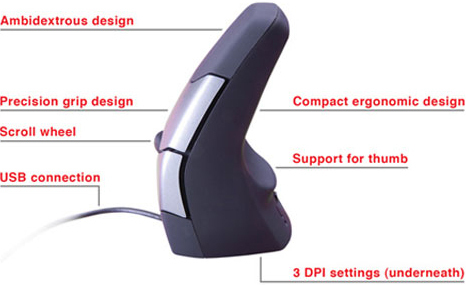 What is required in computer mouse design, therefore, is to enable the best use of all joint and muscle elements of the upper limb. This requirement is not achieved by moving control of the mouse from the smaller muscle groups to the large ones (as in many so called "truly ergonomic" mouse designs) but rather in using the small muscle and joint groups in addition to the large ones. PC, Mac & Linux Compatible. Perfect for detailed work that requires highly accurate tracking. Ideal for laptop and travel use. Because it fits most hand sizes it's perfect for home use to suit the entire family. Can be used right-or-left handed (instantly switch able).